SCVHistory.com | Aircraft Down | Army P-38 Fighter Crashes at Wayside in Castaic; Pilot Leaps to Death. Army P-38 Fighter Crashes at Wayside in Castaic; Pilot Leaps to Death. Pilot Killed When He Bailed Out at 200-Foot Point. Van Nuys News | Tuesday, July 6, 1943. Army officials this week investigated the wreckage of a P-38 fighter plane at the Wayside Honor Farm near Castaic, to determine the cause of the crash that took the life of Second Lieut. Loncie L. Tucker, 28, pilot. Tucker was killed when he leaped from his faltering plane at an altitude of only 200 feet and his parachute failed to open, witnesses said. The plane crashed in flames nearby. 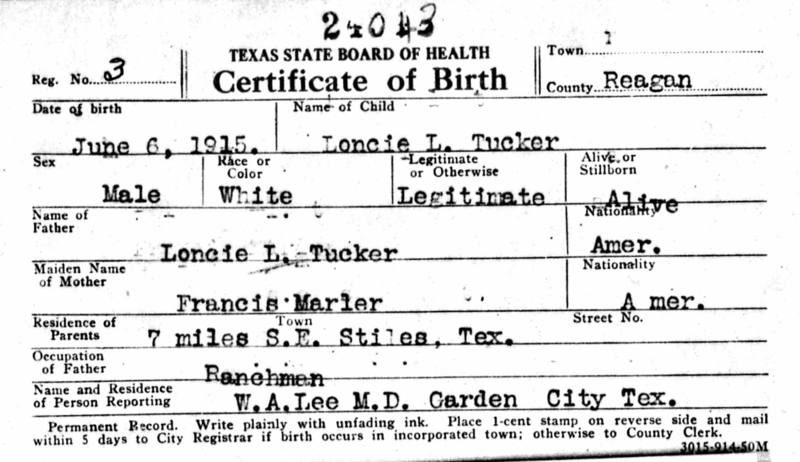 His wife, Mrs. Vera R. Tucker, lives in Glendale. 56 Years After Crash, Family Sees Tribute Paid to Their Fallen Flier. Los Angeles Daily News | By Orith Goldberg, Staff Writer | 1999. Family members of U.S. Army Air Corps 2nd Lt. Loncie L. Tucker Jr. lost a piece of themselves when his P-38 Lockheed Lightning plane crashed at the old Wayside Honor Rancho during a training flight June 30, 1943. Exactly 56 years later, Tucker's two children and their families found comfort as they gathered Wednesday at the site, where officials honored Tucker with memorial in his name and christened the area near the crash site Tucker Canyon. An American flag was placed within the 200-acre area of Tucker Canyon, on the southeast quadrant of the former honor rancho, now the Pitchess Detention Center jail complex. A stone memorial stands off the roadway near the canyon. Tucker's daughter, 61-year-old Sandra Bliss of San Diego, and her brother, Loncie Stroud Tucker, 55, cried as they thanked those who played a role in honoring their father. Bliss, who was 5-1/2 when her father died, said she was proud to live in a country that honors its heroes. "Recently, I heard someone say that the character of a country is determined by the people it honors," she said. "I'm so proud right now to be an American citizen. 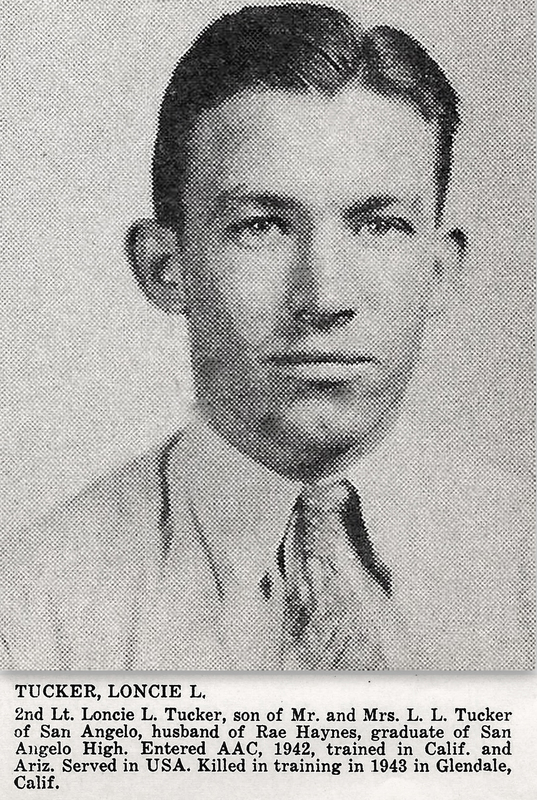 Tucker, on a cross country navigational training flight that June day with three other P-38 Lightnings of the 337th Fighter Squadron of Glendale Army Airdrome, was among 4,000 pilots killed in training during World War II. The search for Tucker was initiated by Bill Bliss, who noticed an article in Pacific Flyer, an Oceanside publication, offering a service to locate accident reports of crashes for a small fee. Bill and Sandra obtained a declassified military report documenting the incident. The document described the location of the crash site as 10 miles north of Newhall Pass on the Los Angeles County sheriff's honor rancho property. Sandra's brother, Loncie Stroud Tucker of Alpine, Texas, a recently retired U.S. Border Patrol agent, received information that the Wayside property was still largely undeveloped and it was still possible to discover the crash site. Tucker called the sheriff's headquarters and made contact with Sgt. Lane Greenberg, who deployed a search party to locate the scene with pictures he had obtained from Tucker's family. During Greenberg's investigation, Sgt. Roger Kelley was conducting a second independent search of his own. Kelley's interest in locating old military plane crashes prompted further inquiry into Tucker's crash after he came upon the the declassified reports. The two groups each located the crash site and invited the families to confirm the location on a cold, rainy day on April 22. "We walked into the canyon, we pointed out the terrain features and (the family) agreed that it was the location," Kelley said. "I think it was very moving, especially for Sandra and Loncie." Birth certificate | Click to enlarge. 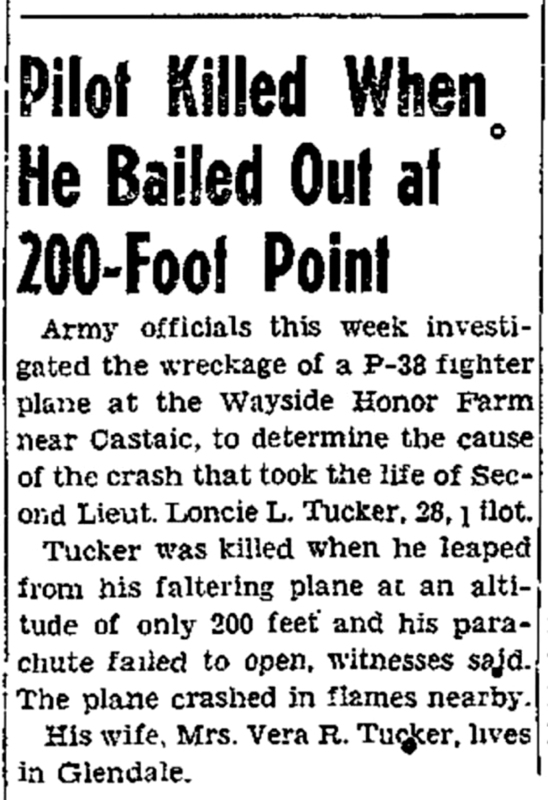 Accident records show that 10 days prior to his death, Army Air Force pilot Loncie L. Tucker crashed another plane — a P-39G, on June 20, 1943, when he was stationed at March Field in Riverside County. It went down 4 miles southeast of that location. 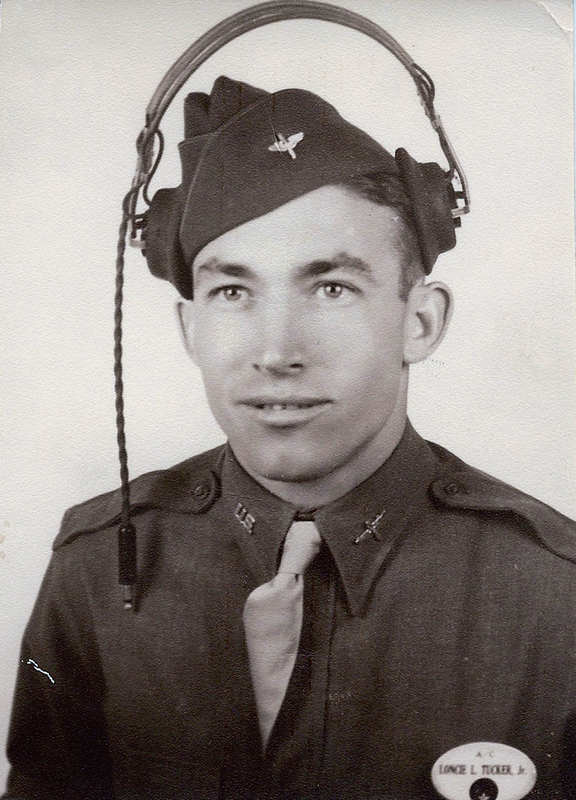 When Tucker was at the controls of the ill-fated P-38G on June 30, he was stationed at Glendale, Calif.
Loncie Lenard Tucker (b. June 6, 1915, in Reagan County, Texas) is buried at Fairmount Cemetery in San Angelo, Tom Green County, Texas. The Aircraft Wrecks book gives an incorrect date of June 3 for the fatal crash (it left the "0" off of "30") and says the mishap occurred when one of the plane's engines cut out.